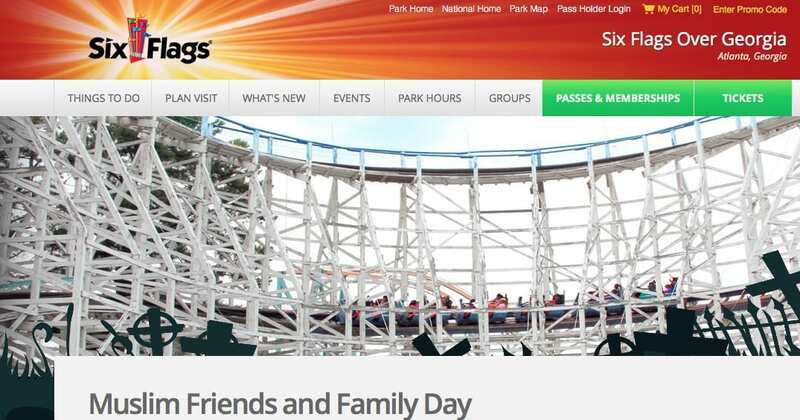 From the ICNA (Islamic Circle of N America): Muslim Family Day is an annual event hosted by the Islamic Circle of North America at Six Flags Theme Parks nationwide. Muslim Family Day was first introduced in 2000 at Six Flags Great Adventure in Jackson, NJ, and has since expanded across the country. The event is one of the largest outdoor gatherings of Muslims in the United States, now attracting around 50,000 attendees a year. Muslim Family Day is the quintessential American Muslim experience and provides the community with a form of entertainment unlike any other. Against the backdrop of Six Flags roller coasters, rides, shows and attractions, Muslims and their friends, families and guests enjoy Halal foods, open-air bazaars featuring Muslim merchants, congregational prayers, informative lectures and a constant stream of Islamic nasheed. Muslim Family Day also raises awareness about Islam and Muslims and promotes a better understanding of the faith. Six Flags Over Georgia is continuing its new holiday tradition as it extends its season with the addition of Six Flags Entertainment’s annual holiday festival — Holiday in the Park. More than one million LED lights and dozens of Christmas trees will create the perfect magical atmosphere this holiday season from November 21 through January 3.